Edge bonded shims or loose leaf shims M-Tech®P (Lamipac) compensate tolerances in a rapid and targeted manner.The following benefits can be exploited when using M-Tech®P edge bonded shims- Large component part tolerances can be compensated for precisely and rapidly in a few steps by using both thick and thin metal shims.- Various materials can be used to recognize the thickness or reduce corrosion.- The sealing requirements of the adjustment element can be met by bonding.Handling is easier if adhesive is only applied at a few points around the circumference of the shim or only on one side, much in the same manner as a tear-off calendar. 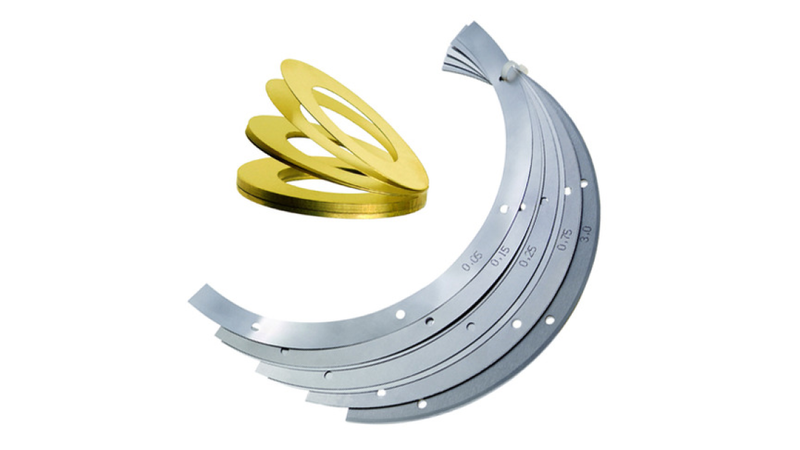 Shim packages can be bundled at a lower price as "loose leaf shims" instead of gluing them around the circumference.M-Tech®P spacer products can be manufactured from brass, mild steel and stainless steel. In this case thin strips with a thickness of 0.025 mm upwards or sheets with a thickness of 3.00 mm are processed.